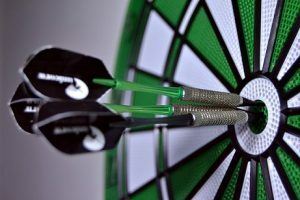 Darts is an extremely popular game these days and you can find at least one or more dartboards set up in most local pubs and taverns all across the globe. One of the things that make it such a popular game is that it combines an element of skill and competition. While you can still find traditional dartboards and darts in some of the bars, pubs, and taverns, many have opted for the new technology of electronic dartboard and soft tip darts. Many more people started switching over to the electronic version for a number of reasons, some of which included undesirable damage to the walls and doors from the very sharp tips of the weighted darts. The soft tips of the new generation of electronic darts are a whole lot safer for kids and adults. This makes it more of a true family activity. For this article, we did plenty of research and came across dozens of electronic dartboard and soft tip dartboard reviews on the Internet. After we completed our research we put together a list of what we consider to be the best electronic dartboard. 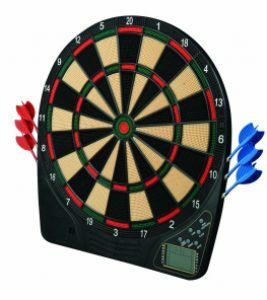 The electronic version of darts and the dartboard that is used to play are designed to be as close as possible to the original. The Cricket Pro 800 features a standard regulation playing area that is an exact match to what you would find on a traditional dartboard. All of the landing areas are matched in size and location making it as close to the same experience as possible. The Cricket Pro 800 features a 15.5″ target area which is consistent with a tournament style dartboard. It comes with 6 standard weight darts with soft tips in two different colors (3 each black and red). The package also includes a bag of extra replacement durable nylon tips. The holes in the target area are square shaped to help reduce the likelihood that the dart would bounce off. It features an electronic scoreboard built in and it comes with 40 pre programmed games with 169 total variations. The Cricket Pro 800 from Arachnid will make the perfect home dartboard so that the whole family can enjoy a relaxing game of darts without having to worry about the kids getting hurt. The 777 Dartboard was designed to the exacting standards of the typical tournament dartboard. The built in scorekeeper eliminates the need to manually keep your own score and it is pre programmed for 43 games and 320 options and it is capable of keeping track of the score for up to 8 individual players at the same time. The package includes 6 standard weight darts with soft tips and colored shafts (3 black and 3 red). The playing area of the Viper 777 was constructed to match a standard 15.5″ face made with a thermal resin material which does a great job of receiving the soft tip of the dart and reduces the likelihood of a bounce out. It features a large LED display for keeping score and it has a bilingual voice in both English and Spanish. The playing area is brightly colored in Blue, Red, White, and Black. It has a large border area to cut down of board misses. 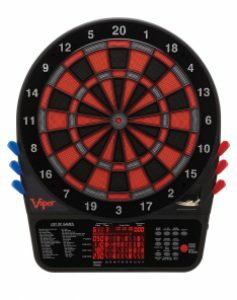 Viper is one of the most widely recognized makers of dartboards and this electronic version well represents the name and quality that you would expect from Viper. The 797 model was designed to match the look and feel of a traditional tournament style dartboard. The material and pattern of the holes were chosen in hopes to eliminate bounce outs as much as possible. The built in scorekeeper and large, bright LED display keeps track and displays the score for up to 16 different players simultaneously. There are a number of pre programmed games and many variations to choose from. The 15.5″ playing area of the Viper 797 is patterned exactly like a traditional tournament style board face. The individual segments on the board are made out of a thermal resin and the whole pattern helps to prevent the likelihood of excessive bounce outs. It comes with 6 starting darts with soft tips along with a package of spare tips. The face features an eye pleasing color palette of Red, Silver, and Black. There 43 games and more than 240 unique variations for your to choose from to get started. 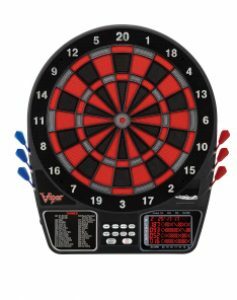 The Viper 797 Electronic Dartboard is packed with a whole lot of features that makes it the perfect choice to replace a traditional dartboard in your game room at home. The Cricket Pro 650 was created to look just like any other tournament dartboard with a similar 15.5″ playing area. This helps to make it easier to use for all of those people who have been used to playing at the local pub where they still have a number of traditional dartboards. The auto scorekeeper keeps track of 1-8 players and audibly alerts the player when it is their turn. The unique hole pattern and unique materials help to prevent as many bounce outs as possible. The large playing area is exactly the same that you will find on a standard dartboard. It also has a wide edge around the scoring area to help prevent misses that could end up damaging the wall around the board. Each of the six darts that come with the board has a soft tip and are typically weighted like a real dart. The darts comes two colors (3 black and 3 red) and fit neatly in inside a holder at the bottom of the board. The scores are displayed with four large LED displays that are really easy to read from a distance. It features 24 pre programmed games including 5 Cricket games and 124 variations of the games. If you are looking for a best electronic dartboard that plays a close to a standard one, then the Arachnid Cricket Pro 650 Electronic Dartboard is the right choice. The Fat Car 727 is designed to resemble a traditional dartboard and plays just like one. The main difference is that it uses soft tip darts instead of the regular sharp pointy metal tipped darts. The surface of the board is covered with micro holes that receive and hold the dart tip in place. The scores are automatically tallied and displayed for each player. There are a number of pre programmed games to choose from. The board features a 13″ scoring area with a wide edge to help prevent accidental misses that could damage the wall around the board. The color pattern features Red, Green, Yellow, and Black is the same that you might find on a dartboard in your favorite pub or tavern. It comes with 18 pre programmed games and 96 different variations to choose from. 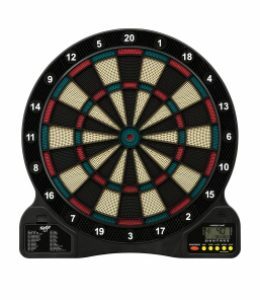 It comes with 6 standards weigh darts which are color coded (3 Red and 3 Blue). It runs on 3 “AA” batteries that are not included. 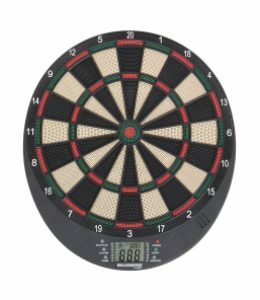 The Fat Cat 727 Electronic Dartboard is great little budget dartboard that plays just like all of the much more expensive boards. The Viper 800 is made by one the best dartboard makers and it is made using the best materials in the business. It features a tournament standard playing surface that is designed to work perfectly with any soft tip darts. It keeps track and displays the scores of up to 16 players and even alerts you of when it is your turn. It comes with a set of 6 darts and it even has a place to hold all six darts plus a bunch of extra tips. The 15.5″ scoring face features a unique thermal resin material with an exclusive ultra thin spider pattern that helps to prevent accidental bounce outs. The face is brightly colored to match a typical dartboard with Red, Silver, and Black. The scores are kept automatically and displayed on four different bright LED. There are 57 pre programmed games with 307 variations to choose from, including several Cricket games. The 6 soft tip darts are color coded (3 Red and 3 Blue) and the tips replaceable. 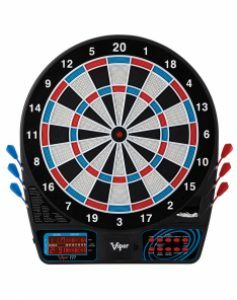 Viper 800 Electronic Soft Tip Dartboard would make a great addition to anyone game room or garage and provide many hours of fun. The FS1500 is a low-cost unit that has the look and feel of a typical dartboard on a smaller scale. It has a smaller (13.5″) playing surface, but it was designed to be used with any soft tip darts available. It comes with a set of 6 soft tip darts with a package of replacement tips included. Players scores are tracked automatically and displayed for all players to see. The FS1500 is designed to receive the soft tip of the darts by having tiny micro holes in the surface of the board. The playing surface is colored in the same pattern found on a typical dartboard. The board is brightly colored with Red, Green, Black and Cream sections. The scores can be easily seen on the small LCD display screen at the bottom. It also has some pre programmed games and sound effects. It runs on 3 “AAA” batteries that are not included. Franklin Sports FS1500 is a decent little electronic dartboard that can be bought by any who is on a budget but still want to be able to enjoy playing darts at home. The Mercury with Cabinet is a classic looking dartboard that will fit in with any room decor. The 15.5″ playing surface features a thermoplastic surface with micro holes designed to receive the soft tip darts which helps to reduce the number of bounce outs. It comes with 6 darts and 6 extra plastic tips. The cabinet includes storage space for up to 12 darts and extra tips. There are numerous pre programmed games and sound effects and voices with two large LCD screens. 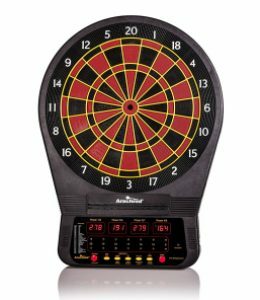 The Fat Cat Best Electronic Dartboard is housed inside of a wood like a plastic cabinet that mounts on the wall. 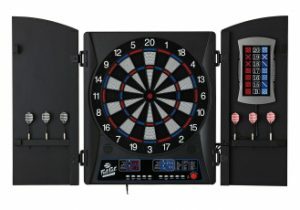 When opened up you see the electronic dartboard in the center with holders for 6 soft tip darts in each door and the right-hand side door has a second color LCD display used for Cricket scoring. There are 34 pre programmed games with 183 scoring variations and it also has audible voices and sound effects. The board features a unique color pattern of Red, White, Blue, and Black. The Fat Cat Mercury would look really good on the wall of anyone’s game room, garage or basement. It has plenty of built in storage for extra darts and replacement tips. The Electronx from Fat Cat is best looking electronic dartboard and cabinet combination. It was designed to look great hanging on the wall in your home or apartment. All of the materials that went into making it are all high quality. The electronic dartboard features a full tournament size playing area. It supports the simultaneous play of up to 8 players and keeps track of each score and even alerts the player when it is their turn with a voice notification. It is designed to be used with soft tip darts and the included cabinet has room to hold up to 12 darts and extra plastic tips. There are numerous pre programmed games and scoring variations. The 15.5″ playing area is the same amount that you will find on a typical tournament style dartboard. The board features thermoplastic segments with micro holes that are designed to receive the soft tip of the darts and prevent too many bounce outs. The face of the board is color coded with Red, Blue, White and Black colored segments. It has 38 pre programmed games and 167 scoring options at the touch of a few buttons. It also has very bright LED display that shows the score of up to 8 players. 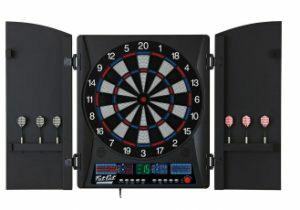 Fat Cat Electronx Electronic Soft Tip with Cabinet would make a great choice for anyone who wants to be able to play electronic darts in their own home. The Bullshooter from Arachnid is an electronic dartboard that was designed with those dart players on a budget. 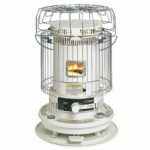 It has some of the features that you would find on more expensive models. It features several pre programmed games and scoring variations. 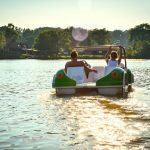 It has a compact playing surface and it can be used in a space that is a bit tighter than a much larger model. It designed to be used with most any soft tip darts and it comes with 6 starter darts. The 13.5″ playing area includes color coded sections for scoring that feature Red, Green, Black and Cream colors. The whole scoring surface is made using thermoplastic with micro holes that help to receive the soft tip dart and it helps to prevent the dart from bouncing out. There are 21 games pre programmed into the board and there are also 65 scoring variations included. It can keep track of the scores for up to 8 people at the same time and display them on the large LCD display. 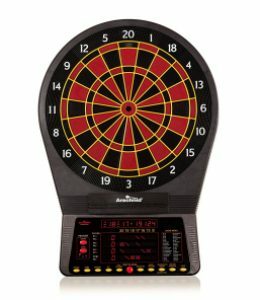 Bullshooter from Arachnid is a decent little budget electronic dartboard that has many of the same features found in much more expensive dartboards.